One who will teach writing, illustrating and how to self publish children's books? 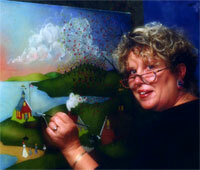 Veteran artist Barbara A. Palmer is available to visit classrooms and demonstrate how she paints with words and brushes. Students will learn the importance of rhyming descriptive words and how to illustrate them. Some of her award-winning books also include finger spelling in American Sign Language. Available books: The Journey of Cattail, Finding Fido the Feline, and A Clue for You: Tail in the Teapot. Workshops will last as long as class period allows. Class size depends on type of room available. The honorarium day with five or six sessions does not include travel expenses. Arrangements can be made prior to visit to purchase books for signing. Contact BP Folk Art Press for more information. A portion of all proceeds generated by BP Folkart Press will be donated to the Humane Society of America.